The footage shows rescuers standing motionless over what looks like an injured man. The video is raising questions about the authenticity of the White Helmets' other frequently posted videos, Vanessa Beeley, independent researcher and journalist, told RT. The Syrian rescue group known as 'The White Helmets' has sparked anger online after posting a video of them faking saving someone while doing the so-called 'mannequin challenge,' the viral video trend in which people freeze in motion and are videoed. The footage shows the rescuers standing motionless over what looks like a realistically wounded man. So realistic, it's raising serious questions about the authenticity of the White Helmets' other frequently posted videos. The controversial video was deleted from the groups' accounts a few hours after it was posted. Plenty regard the White Helmets as heroes of the Syrian war, but its background is somewhat dubious. RT asked the White Helmets what message they wanted to send with their 'mannequin challenge' video, but we've not had a response. RT: What were your initial thoughts when you saw this video? Vanessa Beeley: It was an extraordinary. I’ve been following this since it came online early this morning... we have the whole soundtrack of the bombs falling, the screams and the so on. And what we’re now seeing, whatever reason the White Helmets had for doing this extraordinary event, we’ve seen a reaction that I believe shows that [the mannequin challenge in a war zone] has massively backfired on them. 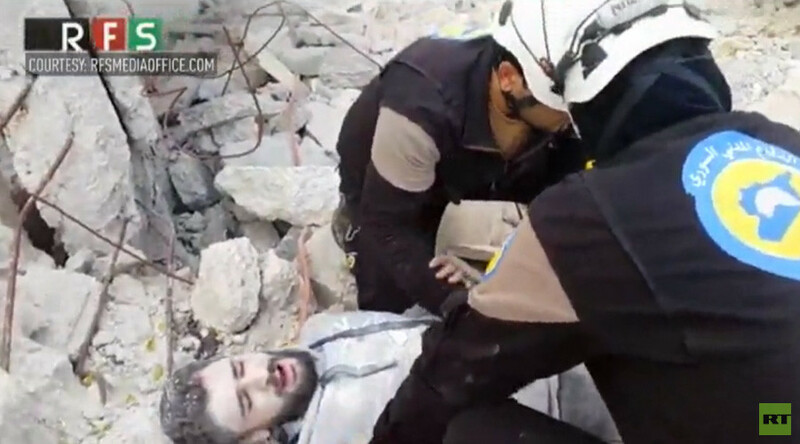 And we know from studying the videos and from talking with real paramedics, particularly the real Syrian Civil Defense on the ground, that there are many questions over the methods used by the White Helmets, suggesting that they are not true paramedics anyway. And many of their videos have been proven to be fake. Children are taken out from under the rubble completely clean, no dust on them, taken out from areas that you can see that they could get out of on their own but taken out to the usual White Helmet paparazzi. RT: Is this a giveaway on how they fake videos? A PR stunt on their part - that's backfired? VB: Absolutely, and if we go back to, I think it was in October, there were various demonstrations across Europe using fake makeup. And again this backfired because people said: “Hold on, this is exactly what all the White Helmet victims look like” when they were looking at the made-up victims and the European protests in support of the White Helmets. RT: You've been very critical of the White Helmets. Why should people be skeptical of what they do? Because they do save lives, don't they? VB: People should question what they do. Firstly, they are a supposed non-governmental organization that is, however, backed and funded by governments like the British government, like the US government, like various EU governments and now by the Qatari government. What we can’t forget is they are funding many of the terrorist factions inside Syria and have been for the last five-and-a-half years. So, they are receiving money from governments who have publicly declared an interest in regime change in Syria. Then, of course, they are embedded in areas that are occupied and controlled by Al-Nusra Front, Al-Qaeda, and ISIS. Those two elements on their own should lead us to question the veracity of their reports and their neutrality. Then if we add to this the various layers, the fact that they have videoed facilitating an execution, they’ve been filmed beating Al-Qaeda prisoners in Idlib. One of their members posted celebratory videos of the execution of two Syrian Arab Army prisoners of war. He was never reprimanded. We were told that he was sacked. They never made a public statement to that effect. And then three weeks later we saw him photographing another White Helmet event in East Aleppo. Even [if] it was a ‘mannequin challenge,’ it’s an extraordinary thing to do in the midst of a war zone. It’s a complete mockery of the suffering of the Syrian people right now under attack from the terrorist and militant factions in West Aleppo, for example. This organization that is about to receive the Right Livelihood Award – and I would ask the Right Livelihood Organization here and now: "Are you happy to be giving this prize to an organization that is this questionable where world media is now questioning the credibility of their reports?"